Training with rewards is linked to more obedient dogs with fewer problem behaviours, according to a survey of owners. 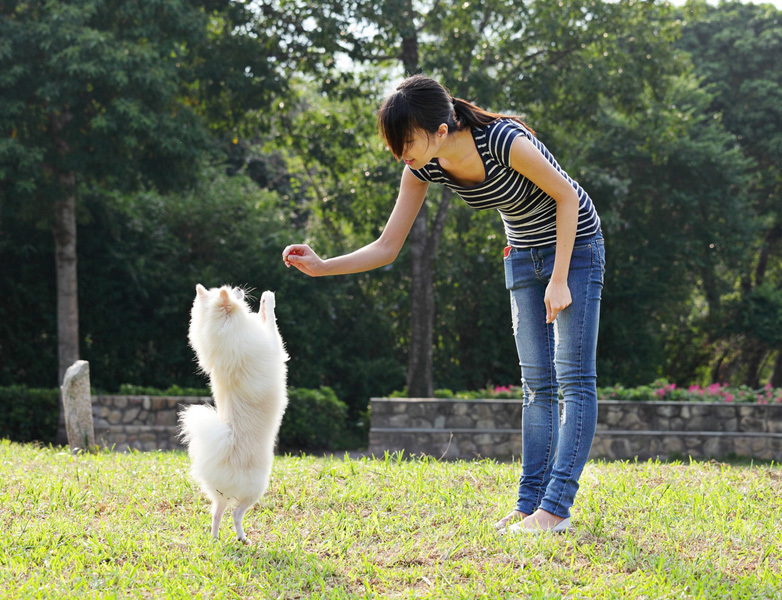 This is the second part in a series about the research on positive reinforcement and dog training. You can read the first part here. This week, we’re looking at study by EF Hiby et al that asked dog owners about their training methods and how effective they were. The researchers approached people walking their dogs at seven popular dog-walking locations in Southampton and Cambridge, such as Southampton Common and Gog Magog Down. They asked them to complete a questionnaire about how they had trained their dog on the basic tasks of sit, leave it, come and walk to heel, as well as how they would react to the common issues of house training, chewing, and stealing items such as food. They also asked them to rate their dog’s obedience. Finally, they were given a list of thirteen problem behaviours and asked to say whether their dog exhibited any of them, such as barking at people or dogs, fear, excitement, and mounting. The researchers only asked people whose dog was at least one year old, so that they would have had time to train the dog. In total, 364 people took part. The dogs ranged in age from 1 to 15, included purebreds and cross-breeds, and included neutered and entire males, and spayed and intact females. On average the owners had previously had at least two dogs. So we can say that they were experienced dog owners and the dogs were fairly typical of the pet dog population in the UK. The owners used their own words to describe the training techniques they used. This is important because it meant they could describe exactly what they did. The training methods were grouped into three types: punishment-based, reward-based, and miscellaneous. Reward-based training used food, play, praise or other rewards. Punishment-based training included physical punishment such as smacking the dog or tapping the nose, verbal punishment such as shouting or being stern, sending the dog to its bed or outside for a while, and a tug on the leash. From a technical perspective, it’s worth noting that this category includes both positive punishment (smacking and shouting) and negative punishment such as time-outs. The miscellaneous category included using newspaper on the floor for toilet training, giving the dog an alternative object to chew, ignoring the misbehaviour, or using pressure to force the dog into a sit. About 10% of the owners used only punishment-based training, 20% used only positive-based training, 60% used a mix of both, and the remaining 10% were hard to classify (e.g. because there wasn’t enough information). Given the range of behaviours that were studied, the results are surprisingly simple: overall, owners that used punishment, whether on its own or in tandem with rewards in training, were more likely to have dogs that exhibited problem behaviours. In addition, the dogs that were trained using reward-based methods only had significantly higher scores for obedience. This study is correlational, and there is a proviso that goes with correlational studies – they don’t prove causality. For example, it’s possible that the initial behaviour of the dog influences the owners’ decision to use rewards or punishment. However, what is excellent about this study is that it focusses on ordinary people, the things they want to train their dogs to do, and the kinds of problem behaviours they have to deal with in real life. This is an interesting finding, and it might surprise those owners who think it is somehow more ‘balanced’ to use a mix of punishment and rewards. This study suggests clearly that using only reward-based training methods works better. See my post on how to choose a dog trainer to find someone who will only use these methods. Next week, I’ll look at another study of dog-training methods used by ordinary people. Will it come to the same conclusion? If you have any questions about this study, please leave a comment. I found this article could compare with the same kind of information in chapter five in the book. Studies showed that the owner of dogs who used positive re-enforcement had dogs that would show positive behavior and would be less likely to repeat a negative behavior. This I found interesting because studies show children who were disciplined mainly with physical punishment are more likely to grow up with aggressive tendencies and have more social issues. The interesting thing to me is with dogs and humans they recommend a verity of skills of rewarding and punishing to be used. Just one error: you say "negative reinforcement (time-out)"
Negative reinforcement is taking away something aversive to the dog. A time out is negative punishment (taking away the good fun times of interacting with family and being in the house or whatever it may be). Negative reinforcement would be something like taking away something scary or painful. Gosh how did that get through?! Thanks for pointing it out. Indeed that's what I meant!